Here's a real breakthrough in Haydn's keyboard writing. 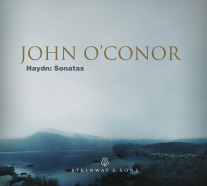 Most of his earlier sonatas had been small-scale teaching pieces, but this work springs from Haydn's Sturm und Drang period, and so is highly emotive rather than decorative. It's also apparently the first keyboard work Haydn dubbed "sonata" rather than "divertimento" or "partita." The opening Moderato abounds with themes. The first is a sobbing introduction, although Haydn obviously counts it as part of the main theme group by bringing it back in the recapitulation. The next three subjects are of greater rhythmic than melodic interest and are, unexpectedly, all in E-flat major. The development section takes these themes through a variety of moods, most of them melancholy, some of them agitated ("storm and stress," indeed). The Andante con modo is an odd amalgamation of the new lyricism and the old learned forms: A poised, sometimes ornate melody sings over what is essentially a contrapuntal accompaniment. This is a highly condensed sonata-form movement, with a short central development of the opening ideas, which are repeated at the end. The Allegro finale is another sonata movement, or perhaps a rudimentary sonata-rondo. An initially assertive theme drifts into busy, decorative material that undergoes a short development. In the recapitulation, Haydn brings back the forceful first theme a second time, effectively making it the basis of the coda.